It's finally here, that August bank holiday that you've been waiting for. Why not kick up your feet and swap your newspaper for your tablet and have a read of our latest blog. This week we are focusing on all things sustainable. As a British Manufacturer we like to support local businesses as well as the environment around us. 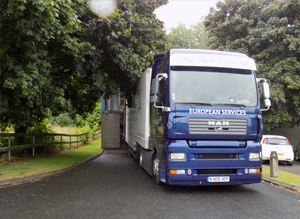 Our product components all come from within the UK or Europe, helping to cut down on transportation. This not only cuts down on Co2 emissions but it also creates shorter lead times for our customers. We are constantly designing and developing to create products with fewer parts and environmentally efficient materials. This reduces our production costs and our energy consumption; as well as making them easier to dismantle at the end of their life, which helps us to manage waste better. We have also implemented a comprehensive Environmental management System which satisfies all elements of the ISO 14001 accreditation compliance. Which basically means we think that looking after the environment is important, so we minimise waste, recycle and reuse as much as possible and make sure that we responsibly source all our materials. 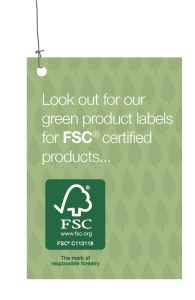 Have you heard of the FSC®? It stands for the Forest Stewardship Council. We work with them to make sure that we are using wood from an environmentally appropriate, socially beneficial and economically managed forests. The majority of our soft and modular seating is FSC certified, so look out for the green product labels to make sure when you're ordering from us, you're also doing the best for the environment. 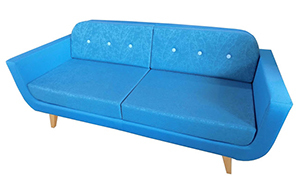 You might have spotted this awesome Coco sofa and bench on our social media pages yesterday. 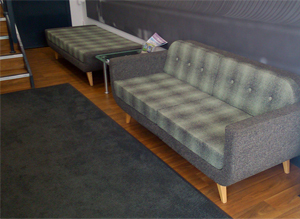 The photo was taken by a member of our marketing team whilst out and about at Camira factory. We think it looks great in their entrance way, the perfect place to relax before a tour round the premises. There was plenty going on in the factory, both for sales and development. We spotted some Landscape fabric ready on a spool to get woven in to that ever so recognisable patterned fabric, which goes so well with the Synergy range. 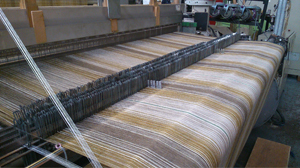 Then there's the mysterious mixture of striped threads set up ready to weave on various looms. It will be interesting to see the finished fabrics. There are so many new and exciting fabrics under development at the moment. 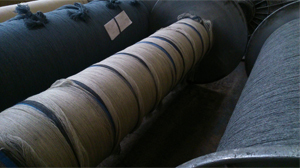 We are soon to see some using recycled natural fibres and others adding to ranges for more and more colour choices. So don't forget to keep your eyes peeled for the next Camira fabric launches. That might be your moment to buy that Nomique sofa you've had your eye on. It was great to see all the rigorous testing that goes on at the factory on all of Camira's fabrics, new and old to make sure they comply with every health and safety measure. Here you can see the CRIB 5 test on one of Camira's natural fabrics. As a general rule natural fibres are automatically flame retardant meaning that the fabrics don't need to be chemically treated to achieve this, unlike all man made fabrics such as polyester. The natural fabrics made by Camira are woven in such a way that most will pass the CRIB 5 test. 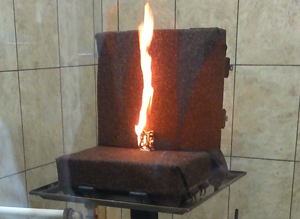 When the natural fibres are burned they char but do not set fire, thus stopping the fire from spreading and making them a much safer option for soft seating. Natural fabrics are also the safer option for the environment, less chemicals means less waste going into our water and air supplies. It also means that at the end of a products life the materials will break down naturally in a much shorter time span than man made materials. So what can you do...? When ordering task or soft seating make sure you select one of Camira's fantastic natural fabrics. It won't sag or puddle, it won't bobble or stretch, it will just make your seating look and feel good. Plus you'll know that you're doing your bit for the environment. 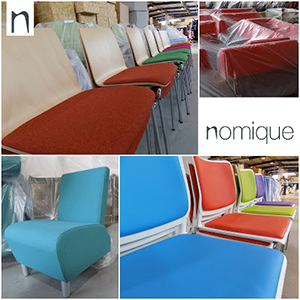 So why not go and have a look at their fantastic range now on their website or give us a call at Nomique on 01952 585828 if you'd like some help choosing the fabric most suitable for your Nomique soft seating products. By now you have probably spotted the Axia 2.0 somewhere. Maybe on one of our blogs, on social media or even in your office. 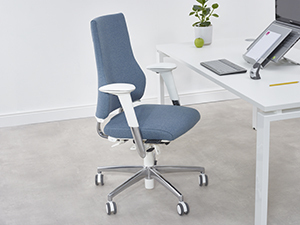 If you do recognise the unique Axia shape then you might already know that it is a fantastic ergonomic chair, designed to help the user sit correctly. However you might not know that it is also an environmentally friendly and sustainable "circular chair". This is part of the Cradle to Cradle principle, everything that is created must be able to be re-used or recycled. Have a look at this video to learn more about the Cradle to Cradle principle. Therefore to achieve this certification the Axia follows a Design for Dissassembly system. It is originally constructed using high quality durable materials making 96% of it's components recyclable. These parts are then reused in new chairs or as part of a complete second hand chair. This means that each new Axia is made from at least 50% recycled material. On 8th April 2015 BMA Ergonomics, the designer of the Axia 2.0 Smart Seating System, was awarded with the official Cradle-to-Cradle certification. The certificate was presented by EPEA, the assessment body for Cradle-to-Cradle Product Certification. EPEA Netherlands has guided BMA Ergonomics during the entire process. If you are interested in doing your bit for the environment, you can do just that by investing in an Axia 2.0. They come with a 10 year warranty and at the end of it's life we will buy it back so that we can continue the ongoing cycle of the Cradle to Cradle principle. For more information on the Axia 2.0 please visit our website. It's that time of week again to get in the know about Nomique and today we'll not only be getting hands on in the factory but we'll also be giving you more tips and fun inspiring ideas to think about. We've had a massive educational order just go through our factory this week and when I say massive I mean MASSIVE! The factory has been filled with task chairs and soft seating from floor to ceiling. The challenge was finding space for it all. We would like to give you a quick whistle stop tour of what goes on in our factory on a daily basis. We thought that this busy busy time would be the best time to give you this insight into Nomique's British Manufacturing. 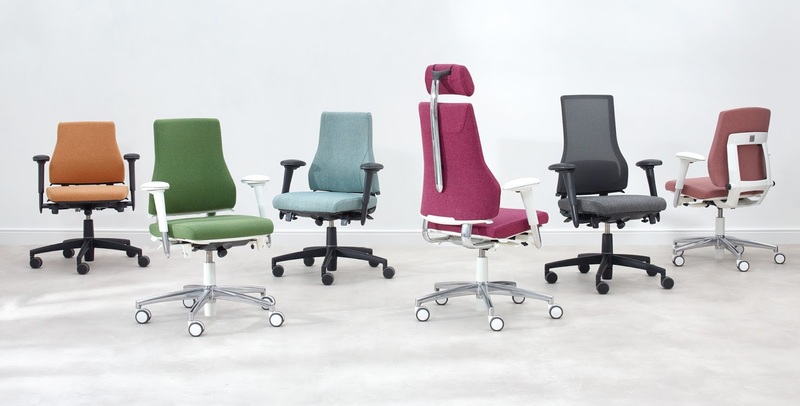 Lots of different seating products have been ordered including Tally task chairs, Jigsaw 2 modular seating, Chicago Modular and Moka meeting chairs and bar stools. The image above gives you a good idea of the end products that have been mentioned. Now have a look at all these products going through the workshop. They all look a bit different without legs and completed upholstery. Some of the 719 Tally's getting their backs fixed on. Attaching the shiny metal legs on to some of the 164 Moka chairs. Carefully upholstering some of the 47 Chicago Modular Seating. The almost finished 26 Chicago Modular bar stools. As well as 14 items from Jigsaw 2. So that's just a small insight into the expansive work that's happening here at Nomique. 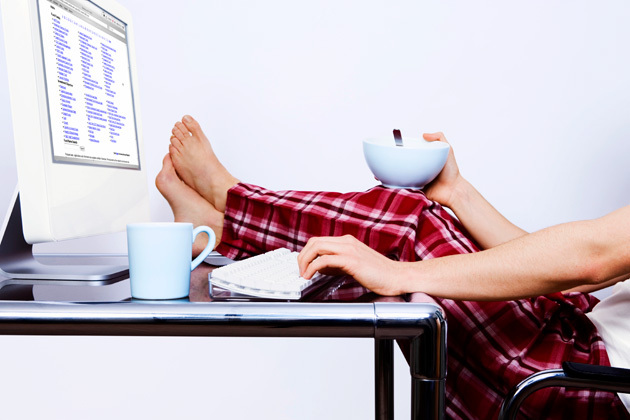 Most of us probably assume that working from home looks a little similar to this. Relaxed, lazy days, doing things at your pace, still in pyjamas, surrounded by food, cups of tea and your favourite music blasting out the speakers. But in reality working from home can be as productive as working from the office, or even more so. A study by Standford University has shown that working from home led to a 13% performance increase due to a quieter and more convenient working environment. Home workers also reported an improved work satisfaction. To make sure that productivity is at it's peak it's therefore important to have a dedicated workspace. Where you can escape the distractions of pets, children, temptation and clutter. This little pod is getting more and more well known for its innovative design. The Archipod craze started in the UK as a garden office hide away. Due to clever use of space and natural light it offers a superb space for the home office. It allows home workers to strictly seperate living space from office space. Have a quick look at this article on design milk to see some more photos of this awesome little space concept. Don't forget that all important office chair. 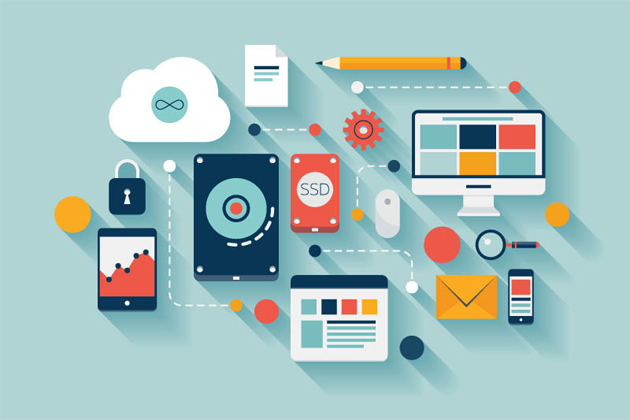 Not only is it essential to try and seperate your office space, it is also necessary to make sure you make that work area as comfortable as possible to increase your productivity. 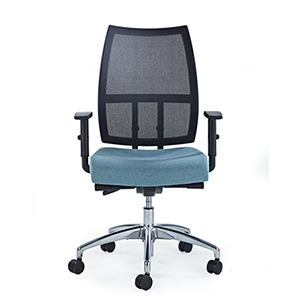 So why not chec out our range of elegant, practical and affordable task chairs on our website. There are lots of things we can be doing as employees and employers to make our desk space as productive, stress free and as organised as possible. Therefore we'd like to share an article with you that we found, that's about 21 tips to tidy up your work space and de clutter your desk. Welcome back to our Weekly Round Up, this week we will be focusing on "Getting Europe Moving". Have you heard about Move Week? Move Week will be going on across the whole of Europe from 7th September to 30th September this year and it's part of the NowWeMOVE Campaign. The objective is of course to get people up and moving around, to promote the benefits of being active and participating regularly in sport and other physical activities. This campaign is being coordinated by the International Sport and Culture Association (ISCA) and is in collaboration with the European Cyclists' Federation (ECF). There is also a great article on their website about the "Inactivity Time Bomb" which has been cropping up in the media a lot lately. Their articles cover lots of interesting facts about how the insufficient physical activity of adults in Europe is seriously affecting their health. However not just our health and wellbeing is affected because the diseases that are often acquired through lack of exercise is now costing Europe 80 billion Euros every year. You may have spotted our MD John Ravenhall flying through the sky on Friday 29th May this year to celebrate his round birthday. Not only did he get physically active doing a tandem sky dive but he also manage to raise £920.01 for Acorns Children’s Hospice. As well as this you might also be interested to know about our staff's long long long walk up Ben Nevis a few weeks back. It definitely wasn't the most beautiful of days but they stayed smiling throughtout and there are definite plans for a next time. So as you can see the staff at Nomique get pretty active a lot of the time and we want to promote how this benefits us in and out of the workplace. Throughout MOVE WEEK we hope to be running multiple activities for our staff to encourage movement and improve awareness about the Inactivity Time Bomb that is ticking ever faster. We would love it if you could comment some ideas below for the kind of activities you would like us to get involved in for MOVE WEEK. How about another hike or a football game as some examples... please get suggesting! Not only do we think that exercise benefits us outside the workplace , it is also important to move around in the workplace. You have probably seen how the workplace is changing and how break out spaces are being encouraged by employers to improve collaboration and creativity. Well our Lux range is a great example of this, check out our Lux article to gain more understanding about this new range. Today however we want to focus on movement in the workplace for those still stuck at their desks 9-5. 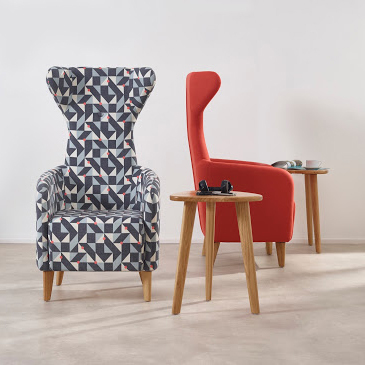 Designed with movement and wellbeing in mind the Axia Smart Chair teaches the user to sit correctly and encourages them to get up and move around. With the smart sensor system the chair gives the user feedback on their sitting behaviour and posture. The vibration in the seat acts not only as a trigger to correct your posture, but is also a reminder to get out of the chair and move around. Learn more about the Axia Smart Chair. It is typical to hear tales of back or neck pain, headaches and fatigue in the workplace but the Axia Smart Chair is aiming to help staff avoid these common ailments. This smart technology helps users to receive the full ergonomic benefits of sitting in an Axia chair correctly. For an interesting article about sedentary working and how important it is to move around check out THIS. If you'd like some more information about the Axia Smart Chair or about others from the Axia range then please go to our website. Breaks - make sure to either go for a walk to get to lunch or at least make sure you eat lunch elsewhere. This will cut down on the time spent at your desk. Get up to get a tea round for your colleagues. Do you have a sit-stand workstation? Adjust the desk height and work standing up for the next half hour. Take the steps instead of the elevator. Have meetings while standing up. It's quicker, more effective and healthier. It's not how long you stand for, it's how often. Try to stand up every 10 minutes or so, you'll feel better for it. We found three articles with more tips and information to get moving at work. Put some movement into your desk job. How to stay active in the office. No time to work out? Six quick exercise you can do at your desk. However here at Nomique there is plenty of bright, colourful fabric to cheer up even the most miserable days! Have you spotted these out and about yet? We've got ply Moka's in the top left. Then a simple turquoise Gomez in the bottom left. And of course you can't help but spot the bright Chippers at the bottom. Don't forget the Elements Core sofas hiding in plastic wrapping ready to go in the top right. Beautiful vibrant Halcyon Blosson Botanic by Camira Fabrics. It looks sleek and simple to start with but when it hits the light the branch pattern is striking, it really brings the fabric to life. If you recognise that then you might also remember this from today's clues and yes it also has buttons. So far we've had the guess that it's going to be a go kart but unfortunately we're not allowed that much fun in the factory. Don't you think it's just fabulous! We would love to hear your thoughts so please find us on social media and leave a comment. Also make sure to look out for some close up shots on our Facebook page. Want to get a Coco for yourself why not have a look at the options on our website or see some other fabric styles in our last Weekly Round Up. 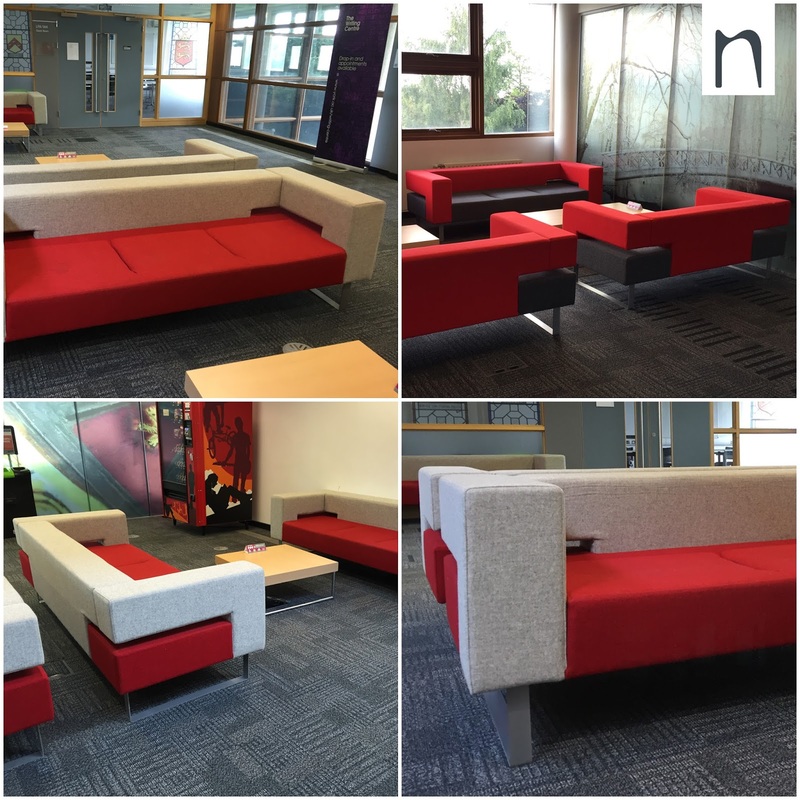 It's great to see Nomique's Chicago sofas and Tally task chairs are still being used at University's and that their design is so timeless. We think the two tone fabric choices on these sofas really make them a feature of the room, creating a very engaging space to break out. The black and red has a real class about it, great for students wishing to escape the hard trials of their degrees or to have lots of creative chats. It's great to see our Tally task chairs lining University study rooms as well. Those students must be incredibly comfy whilst doing those long long long study hours. Interested in our Chicago sofas or our Tally task chairs then click the links and have a browse. The team have really enjoyed reading the new mix interiors July issue. There are some fantastic articles. We thought the Spotlight on Wellbeing was a great read. Want to know how Nomique can improve wellbeing in your workspace? We think that our Lux range creates a space that definitely improves wellbeing in the workplace. Why not have a look at our Lux blog?